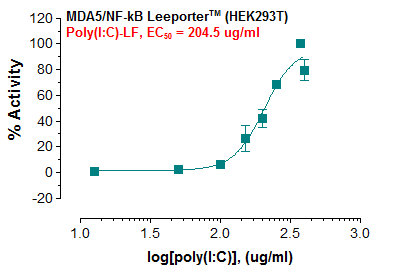 Fig-1: Induction of MDA5 activity by poly(I:C) prepacked with lipofectamine in MDA5 Leeporter™ – HEK293T cells. 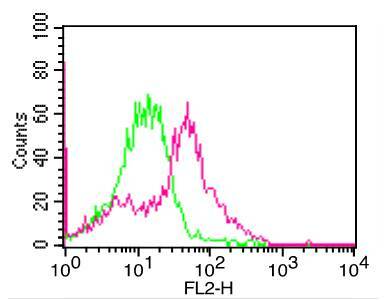 The MDA5 reporter cell line is a stably transfected HEK 293T cell line which expresses human melanoma differentiation-associated protein-5 (MDA5) and Renilla luciferase reporter gene under the transcriptional control of an NF-kB response element. As a dsRNA helicase enzyme, MDA5 is encoded by the IFIH1 gene. 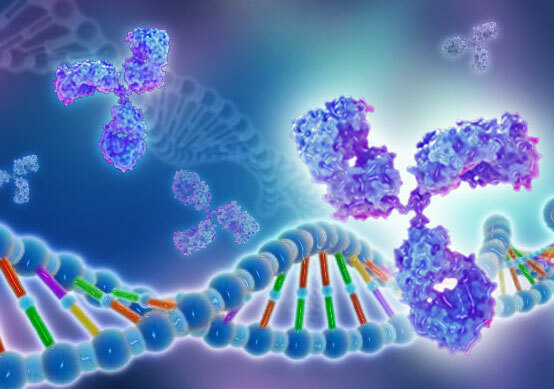 MDA5 is one of the RIG-I-like receptors (RLRs) that are a family of DExD/H box RNA helicases including MDA5, RIG-I and LPG2, which play a major role in pathogen sensing of RNA virus infection to initiate and modulate antiviral immunity. 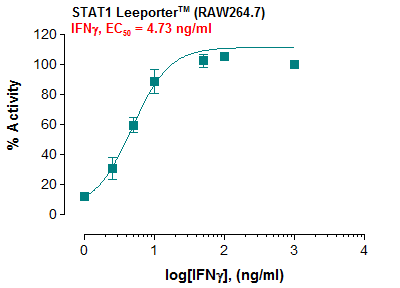 RLR expression is typically maintained at low levels in resting cells but is greatly increased during inflammation, specifically with IFN exposure and after virus infection. MDA5 detects cytoplasmic dsRNA generated during viral replication unlike Toll-like receptor 3 (TLR3) which can detect phagocytosed dsRNA in endosomes. 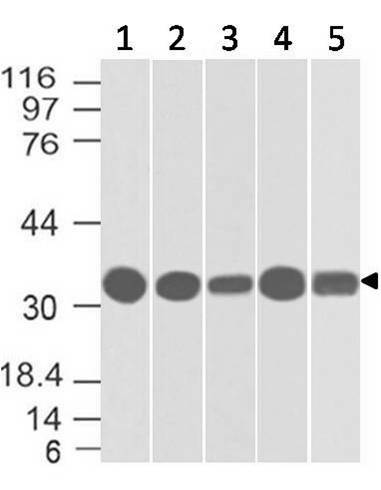 MDA5 also responds to poly(I:C), the synthetic analog of viral dsRNA. 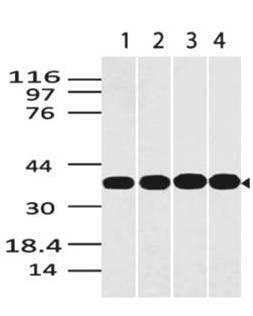 The MDA5 activation by poly(I:C) is shown in Figure 1. 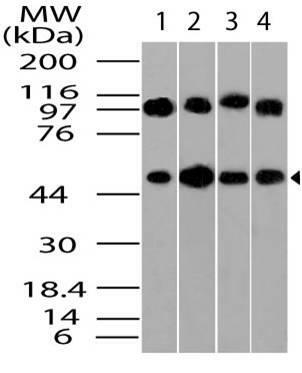 Content : Each vial contains 2 ~ 3 x 10^6 cells in 1 ml of 90% FBS + 10% DMSO. Storage condition : Immediately upon receipt, store in liquid nitrogen. Monitor the MDA5 signaling pathway activity. 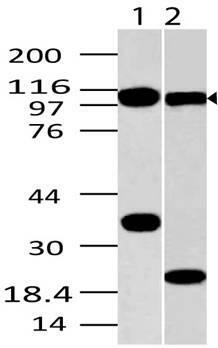 Screen for activators or inhibitors of the MDA5 signaling pathway. 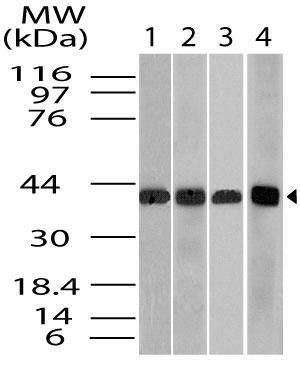 Cells should be grown at 37oC with 5% CO2 using DMEM medium (w/ L-Glutamine, 4.5g/L Glucose and Sodium Pyruvate) supplemented with 10% heat-inactivated FBS and 1% Pen/Strep, plus 2 µg/ml of Puromycin and 5 µg/ml Blasticidin (Note: Puromycin and Blasticidin can be omitted during the reporter cell assays). It is recommended to quickly thaw the frozen cells upon receipt or from liquid nitrogen in a 37oC water-bath, transfer to a tube containing 10 ml of growth medium without Puromycin and Blasticidin, spin down cells, resuspend cells in pre-warmed growth medium without Puromycin and Blasticidin, transfer resuspended cells to T25 flask and culture in 37oC-CO2 incubator. Leave the T25 flask in the incubator for 2~4 days without disturbing or changing the medium until cells completely recover viability and become adherent. Once cells are over 90% adherent, remove growth medium and passage the cells through trypsinization and centrifugation. At first passage, switch to growth medium containing Puromycin and Blasticidin. Cells should be split before they reach complete confluence. To passage the cells, detach cells from culture vessel with Trypsin/EDTA, add complete growth medium and transfer to a tube, spin down cells, resuspend cells and seed appropriate aliquots of cells suspension into new culture vessels. Subcultivation ration = 1:10 to 1:20 weekly. 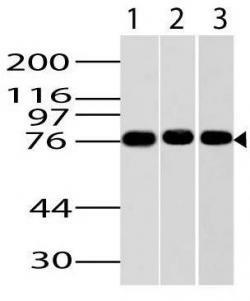 To achieve satisfactory results, cells should not be passaged over 16 times. A. 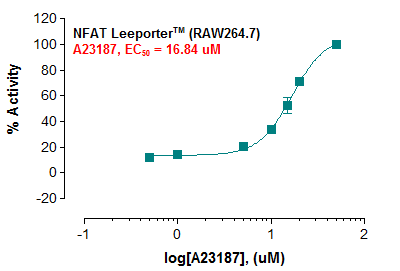 Response of MDA5 Leeporter™ – HEK293T cells to Poly(I:C). 1. 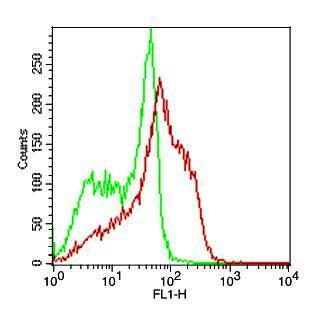 Harvest MDA5 Leeporter™ – HEK293T cells and seed cells into a white solid-bottom 96-well microplate in 100 µl of growth medium at 5 x 10^4 cells/well. 2. Incubate cells at 37oC in a CO2 incubator for overnight. 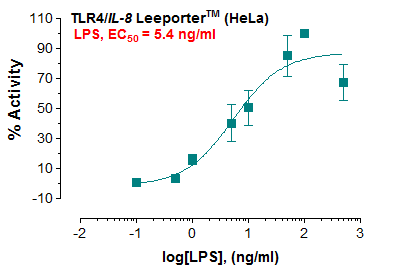 i) A 50 µl of 10 mg/ml poly(I:C) (= 500 µg total) is preincubated in 50 µl Opti-MEM (Life Technologies) for 5 min. 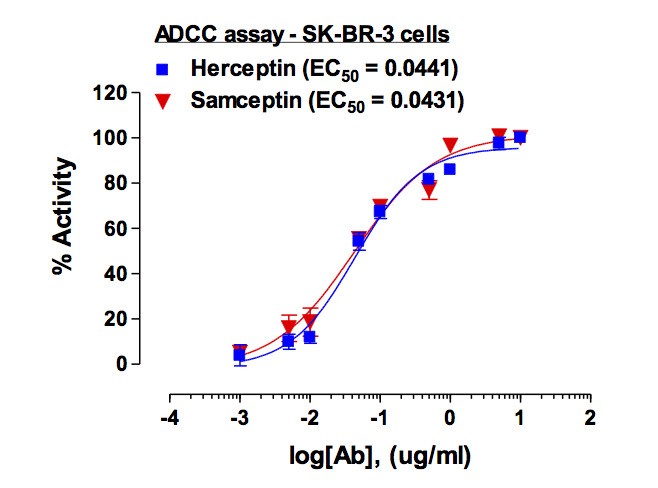 ii) Similarly, a 20 µl Lipofectamine 2000 (Life Technologies) is preincubated in 80 µl Opti-MEM for 5 min. iii) After 5 min, they are combined together as a total volume of 200 µl and further incubated for 20 min at room temperature. iv) The poly(I:C) packed with Lipofectamine 2000 (A 200 µl total at 2.5 mg/ml) is then used to stimulate cells. 4. Incubate at 37oC in a CO2 incubator for 6-16 hours. 5. 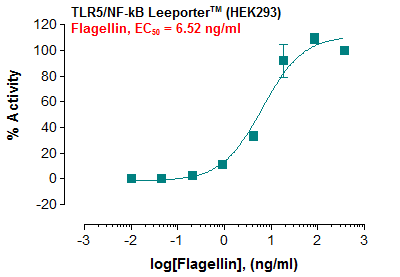 Add 50 µl of luciferase assay reagent (Abeomics, Cat #17-1101) per well. 6. Incubate at room temperature for 1-5 minutes and measure luminescence using a microplate luminometer. THIS PRODUCT IS SOLELY FOR IN VITRO RESEARCH USE ONLY. NOT FOR DIAGNOSTIC OR THERAPEUTIC USE. By use of this product, user agrees to be bound by the terms of this limited use statement. This product is solely for Internal Research Purposes and not for Commercial Purposes. 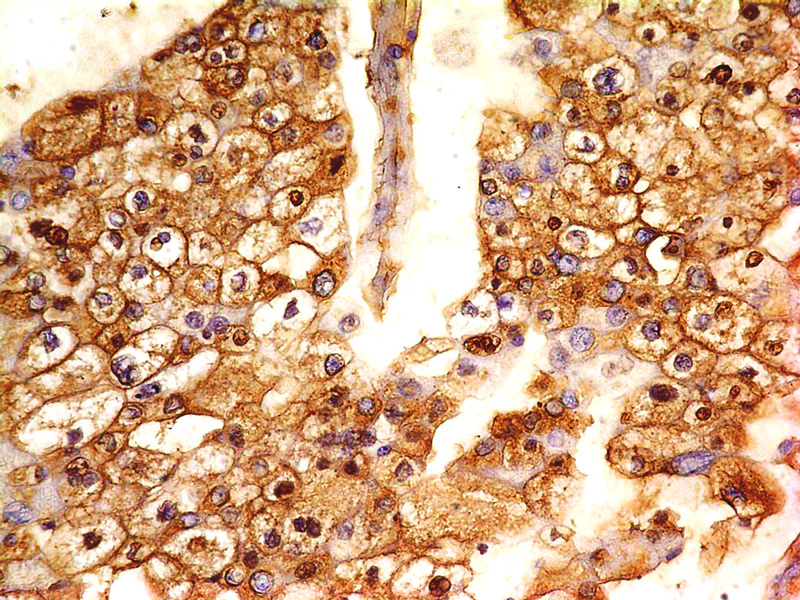 Commercial Purposes include, but are not limited to (1) use of the cell line in manufacturing; (2) use of the cell line to provide a service, information or data; (3) use of the cell line for therapeutic, diagnostic or prophylactic purposes; or (4) resale of the cell line whether or not such cell lines are resold for use in research. The buyer cannot sell, give or otherwise transfer this product to a third party. Commercial License Agreement is available for non-research use if applicable. Please contact Abeomics (info@abeomics.com).